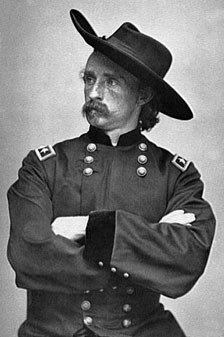 The American cavalry soldier George Armstrong Custer was born in New Rumley, Harrison County, Ohio, on the 5th of December 1839. He graduated from West Point in 1861, and was at once sent to the theatre of war in Virginia, joining his regiment on the battlefield of Bull Run. Afterwards he served on the staff of General Kearny, and on that of General W. F. Smith in the Peninsular Campaign. His daring and energy, and in particular a spirited reconnaissance on the Chickahominy river, brought him to the notice of General George B. McClellan, who made him an aide-de-camp on his own staff, with the rank of captain. A few hours afterwards Custer attacked a Confederate picket post and drove back the enemy. He continued to serve with McClellan until the general was relieved of his command, when Custer returned to duty with his regiment as a lieutenant. Early in 1863 General Pleasonton selected him as his aide-de-camp, and in June 1863 Custer was promoted to the rank of brigadier-general of volunteers. He distinguished himself at the head of the Michigan cavalry brigade in the battle of Gettysburg, and frequently did good service in the remaining operations of the campaign of 1863. When the cavalry corps of the Army of the Potomac was reorganized under Philip Henry Sheridan in 1864, Custer retained his command, and took part in the various actions of the cavalry in the Wilderness and Shenandoah campaigns. At the end of September 1864, he was appointed to command a division, and on the 9th of October fought, along with General Merritt, the brilliant cavalry action called the Battle of Woodstock. Soon afterwards he was made brevet-major-general, U.S.V., having already won the brevets of major, lieutenant-colonel and colonel U.S.A., for his services at Gettysburg, Yellow Tavern and Winchester. His part in the decisive battle of Cedar Creek was most conspicuous. He served with Sheridan in the last great cavalry raid, won the action of Waynesboro, and in the final campaign added to his laurels by his conduct at Dinwiddie and Five Forks, and in Other operations. At the close of the war he received the brevets of brigadier and major-general in the regular army, and was promoted major-general of volunteers. In 1866 Custer was made lieutenant-colonel of the 7th U.S. Cavalry, and took part under General Winfield Scott Hancock in the expedition against the Cheyenne Indians, upon whom he inflicted a crushing defeat at Washita river on the 27th of November 1868. In 1873 he was sent to Dakota Territory to serve against the Sioux. In 1876 an expedition, of which Custer and his regiment formed part, was made against the Sioux and their allies. As the advanced guard of the troops under General Terry, Custer's force arrived at the junction of Big Horn and Little Big Horn rivers, in what is now the state of Montana, on the night of June 24; the main body was due to join him on the 26th. Unfortunately, the presence of what was judged to be a small isolated force of Indians was reported to the general. On the 25th, dividing his regiment into three parties, he moved forward to surround this force. But instead of meeting only a small force of Indians, the 7th were promptly attacked by the full forces of the enemy. The flanking columns maintained themselves with difficulty until Terry came up. Custer and 264 men of the centre column rode into the midst of the enemy and were slaughtered to a man. The general's wife, Elizabeth Bacon Custer, who accompanied him in many of his frontier expeditions, wrote Boots and Saddles, Life with General Custer in Dakota (1885), Tenting on the Plains (1887) and Following the Guidon (1891). General Custer himself wrote My Life on the Plains (1874). His brother, Thomas Ward Custer (1845-1876), in spite of his youth, fought in the early campaigns of the Civil War. Becoming aide-de-camp to General Custer, he accompanied him throughout the latter part of the war, distinguishing himself by his daring on all occasions, and winning successively the brevets of captain, major and lieutenant-colonel, though he was barely twenty years of age when the war ended. He was first lieutenant in the 7th cavalry when he fell with his brother at the Little Big Horn.